Like many across our province, we were devastated to learn about the horrible fire that struck the warehouse of the Community Food Sharing Association. 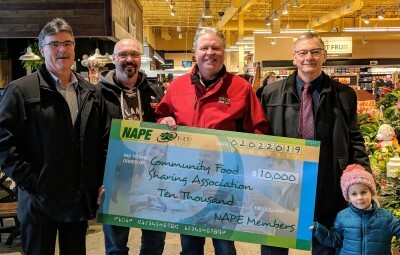 Today (February 2), on behalf of all NAPE members, we were incredibly proud to donate $10,000 to the association to help them get back to supporting our province’s most vulnerable. The tremendous response from the community in response to this event has been inspiring and we are so happy to play a part in that effort.